In recent months I have heard a number of smoky-voiced jazz singers. At times I have wondered how natural the voices were. Sometimes, listeners can hear a singer who is out of his or her range. Tell-tale frizzes and dropped notes are often giveaway clues. When a singer takes on standards, sometimes it is easier to hear problematic vocal quirks. The instrumentation is almost perfect. The sound is lush, perfectly timed, and neither overwhelms nor hides behind Ainsworth’s voice. The brushed drums and bright saxophone strike a particularly nice balance with the vocals on ‘Long Ago & Far Away/You Stepped Out of a Dream.’ In addition, ‘I Once Knew a Fella’ is as close to raucous as this collection is going to get, and it sounds like the entire ensemble has turned up a notch or two. Suddenly, early rock and roll elements of saxophone and drums replace the group’s standard jazz sound. It’s a fun song. The vocals are half spoken, and that plays up the flirtatious vibe Ainsworth inflects. “Ainsworth’s father played with Sam Butera, so this retro revival thing is in her blood legit and sometimes it just doesn’t pay to fight what you are. With another lounge revival swinging our way, she’s right at the forefront of the revival, unearthing worthy songs that haven’t been recorded in the last 50 years, which culls her from the rest of the diva pack that think it all begins and ends with Cole Porter. Loesser, Mercer, let’s bring them all back. “A delicate equilibrium exists between well-intentioned ‘vintage’ performance and cynical parody. Bands like the Cherry-Poppin' Daddies will thrill those listeners who believe they have finally found the ‘real’ thing without having listened to music recorded before 1950. It is always a dicey thing to claim one is performing vintage anything. “It took the world years to discover that the DFW Metroplex is home to lots of great jazz. 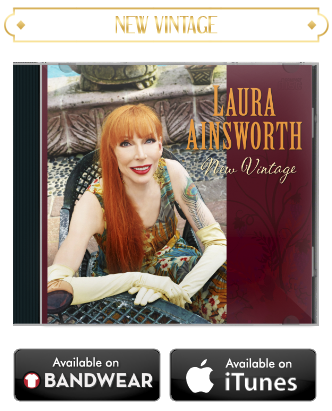 But there’s a fast-rising new sub-genre of jazz – vintage revival (lounge, exotica, bachelor pad music of the ‘40s-‘60s) – and with the release of her third album, New Vintage, and a best-of audiophile vinyl LP titled Top Shelf, DFW vocalist Laura Ainsworth is already being recognized worldwide as a leader of the movement. ..